We held our Golf Day and Reunion at Sprowston Manor again this year. Unfortunately the un-summerlike weather we had experienced during June threatened our golf event. Although it was raining when we teed-off it did eventually, as was forecast, become a pleasant afternoon and evening. The golfers enjoyed the challenge and the weather, as it improved, enabled us to be joined, as in previous years, by the non-golfers at the golf clubhouse as we finished our round of golf. We assembled in the Suffolk Suite in the evening where we enjoyed the meal and the company. Unfortunately the evening was all too short and it was impossible to spend the time we wished with all the friends we met. 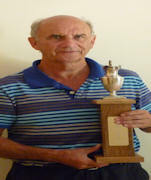 A photo of our winner, Barry Adkins, with the Trophy. Hopefully we will all meet again next year and the convenient and available day is likely to be July 5th 2013.